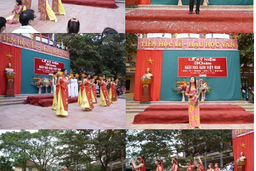 Trieu Quang Phuc High School, which has nearly 40 years of history, is situated in Yen My District, Hung Yen Province - one of the most peaceful locations in our country – Vietnam. The school consists of 5 buildings in total. The building nearest to the school gate is the one for the staff of teachers. It is quite nice and well-conditioned. The principal and the vice principle have a private room each. There is also a room appropriately equipped for cooperative activities and some other rooms. This building is one of the most gorgeous buildings in the school and almost becomes our pride. Two of the rest are the building A and B, which have classrooms for students. The school has 24 rooms and each is not only spacious but also bright. The functional buiding is indispensable to mention. Students often carry out experiments during Chemistry, Biology, Physics… periods in this building and take part in different kinds of activities. The one located behind the building A is the oldest buiding, since 1980s. The school yard is quite big and there are many trees and banchs, allow students and teachers to relax after such stressful periods. 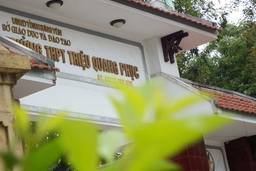 In general, Trieu Quang Phuc High School is an ideal place for students to study and improve themselves. The school has nearly 61 staff, including one accountant, one cashier, one librarian, one nurse, two guards. The rest are the headmaster and teachers of different subjects. All of our teachers are efficient and helpful. 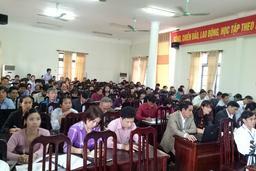 The number of teachers should be compatible with nearly 1000 students in the school, divided into 24 classes. Teachers are set up in their exact fields and there is no lack of teachers any more. Like the general education system, there are 13 subjects being taught in the studying activities. Three compulsory subjects are: Math, Literature and English. Both teachers and students always focus on these subjects, especially English because English is very important for students to interact with the outside world. 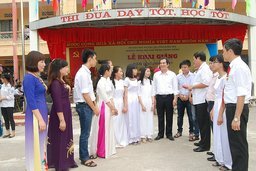 Trieu Quang Phuc High School has a good movement of academy. The school usually overtops other districts and take the lead in the movement for achievements. The rate of graduation is approximately 100% and the number of students passing the entrance examination of university is very high. In addition, there are many outdoor activities, which give students an opportunity to communicate and express themselves. Therefore, students would be both healthy and creative. 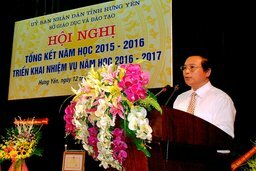 Importantly, in 2015, Trieu Quang Phuc is proudly to be recognized as a national standard school. The school is gradually changing for better and step by step becoming a very good environment for students to study. Teachers and students in my school are looking forward to your support. 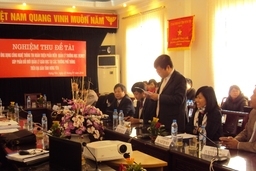 In fact, we were highly impressed by the way of teaching you demonstrated in Hung Yen in four days in July. We hopefully believe that the cooperation between us will better for our students’ development.